Mathias Bengtsson (Danish, b. 1971), Slice Chair, 1999. Aluminum; 29 1/2 x 35 x 29 in. Milwaukee Art Museum, Gift of Friends of Art M2011.11. Photo credit John R. Glembin. © Mathias Bengtsson, Courtesy of Industry Gallery. In honor of last week’s opening of European Design Since 1985: Shaping the New Century, I thought I’d share a bit about why the Museum has used this striking aluminum chair so heavily in the exhibition’s marketing. You saw this chair’s curves on banners and the cover of the MAM Insider (the Museum’s Member magazine), all over the Museum’s exhibition website, and even on little details like admission vouchers. As a lover of beautiful things, I’m drawn to the dazzling shimmer of the aluminum surface and the undulating form of this design. As a curator who loves to talk about art, I’m also drawn to the ideas behind the chair. I feel like you could talk about this chair all day. Mathias Bengtsson (Danish, b. 1971) is an up-and-coming designer who currently resides in Sweden. His work often incorporates the latest technology and materials. Another of his objects on view in the exhibition, the C8 Spun Carbon chaise, uses new carbon fiber fuel line hose material developed by NASA. 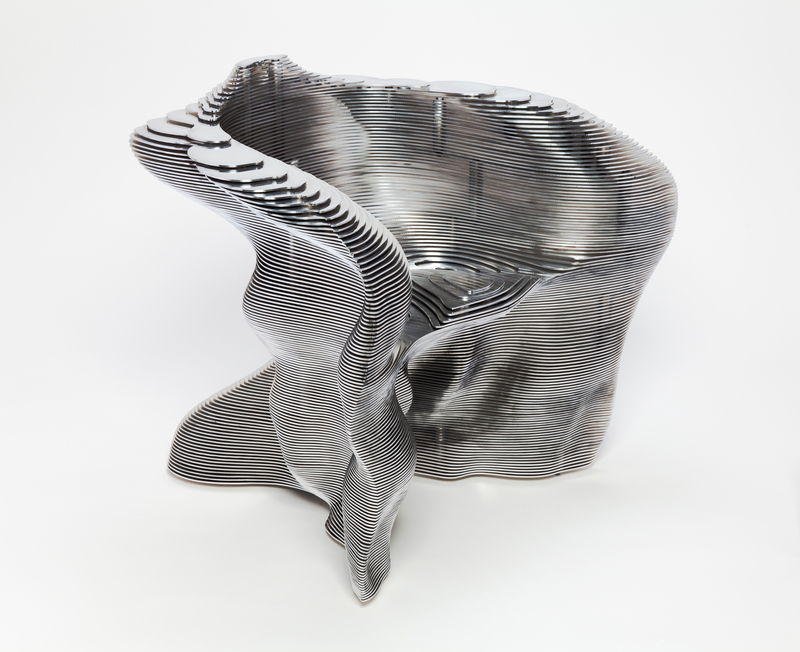 For the aluminum Slice chair, which is part of the Milwaukee Art Museum’s permanent collection, Bengtsson used precise laser-cutting techniques, but he applied this precision to a form that he had modeled with his own hands. The chair started as clay, hand-manipulated to Bengtsson’s preferred undulating shape. The artist then turned his work over to a computer to read the shape and create slices of aluminum only three millimeters thick. Bengtsson then carefully hand assembled the slices into the chair form. In the end you ask, is this chair crafted by hand, or computer? To me, this idea is connected to much of the most exciting design work right now. Many designers are actively questioning what design even is, and how it relates to and incorporates both handcraft and new technologies. Their work is showing that design is not independent of craft, and in myriad ways, we see designs that totally obliterate the line between art, design, and craft. For instance, the show also includes Knotted chair, at right, designed by Marcel Wanders (Dutch, b. 1963), a new icon of late 20th-century design. 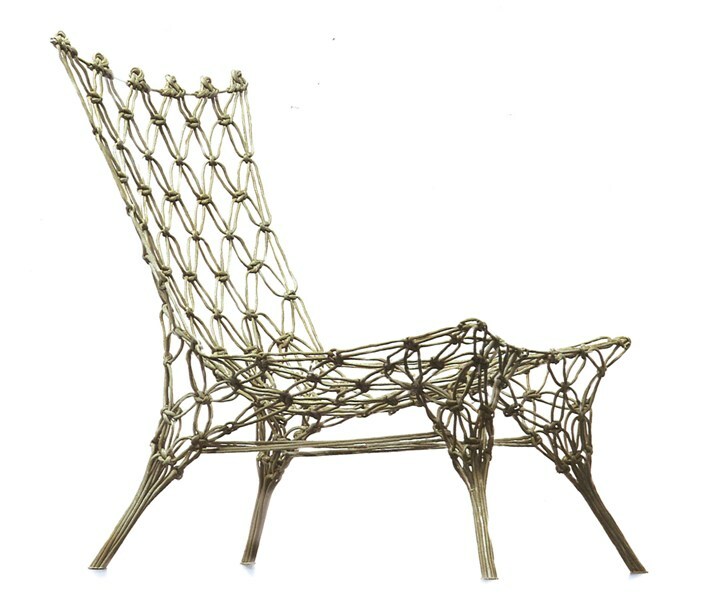 Knotted chair uses carbon fibers knitted into a casing and arranged into a type of macrame sling. The whole object is dipped in resin and hung to slump into shape with the help of gravity. The resulting chair is light, strong, high-tech, and handcrafted all at once. -Update- This post was updated on June 26, 2012 with new photography of the Slice Chair. We are thrilled to now have this chair in our exhibition, so I returned to an old blog post to update the information and include our Museum’s photographs. Thank you to the Museum’s Friends of Art for funding this terrific acquisition. 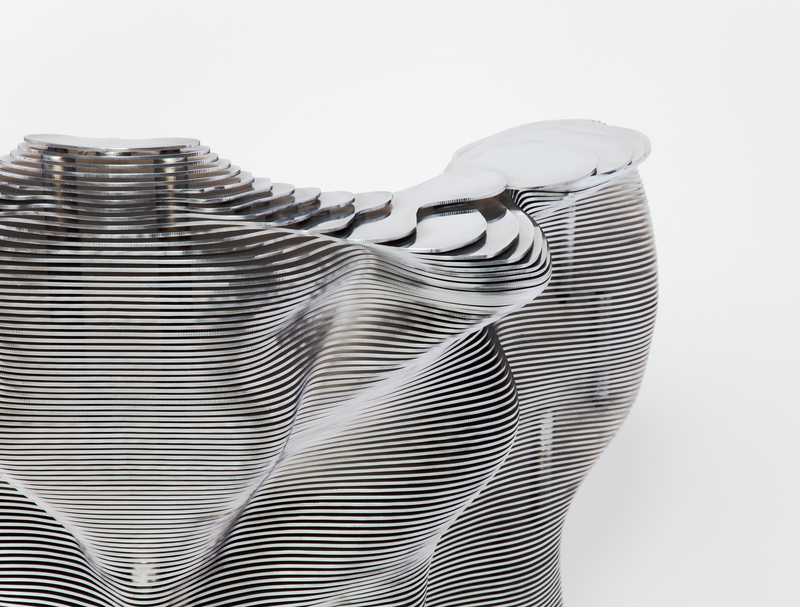 This entry was posted in Art, Curatorial and tagged Behind the Scenes, Decorative Arts, Design, European Design Since 1985, Exhibitions, Mathias Bengtsson. Bookmark the permalink.